Quilting and Life in General: You know all those things I put off til "Later"? It's LATER! You know all those things I put off til "Later"? It's LATER! I am now discovering life "after the Quilt Show"! I'm still finishing up on the QOV paperwork. I don't trust my mind to remember what to do next year!! I'm still so very glad we did a presentation. Oh my, it was so moving. 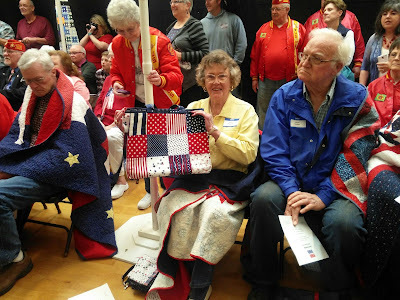 We presented 17 veterans with quilts to standing room only space. By default, I was the host at the program. Now, I'm the first to admit I don't have much problem talking!! LOL! But that is usually to friends and fellow quilters. I can talk about quilts for hours - paid or unpaid!! But this was different. I was talking to veterans and I know I am not worthy. They have gone through so much, for our benefit. I didn't want to offend, or make them feel uncomfortable. I was so nervous, even before, writing the speech, figuring out the logistics and after seeing the crowd, I panicked! Too late to quit now! Breathe ... So I simply kept my eyes on the veterans in the first row and talked to them! It worked! I teared up a few times, (I wasn't the only one) but I didn't break down. The veterans were awesome, loved their quilt and even loved their hug! Really loved their hug - I'm positive I got another hug from each of them as they left. The support around them was spectacular. We already have SEVEN nominations for next year! And more quilters pledging to join the QOV portion of our guild! What can I say - my mother raised me right. Okay, I don't always follow my training ... BUT I did after this. I wrote an article for the newspaper, (they printed it!) I wrote thank yous to the Veterans' Groups, and the Honor Guard. I also sent a thank you with a picture of the group with their quilts to our QOV Long Armers (machine quilters). I told them thank you and how glad we were for their part of QOV. We worked with seven quilters - and not a one of them had EVER been thanked with a picture of 'their' veterans with the quilts! Really? They do half the work!! Note to self - always do that! But I'd been putting off things until "later" and LATER has arrived with a vengeance! This weekend I'm working on my new granddaughter's quilt. She is expected to be born June 21st! Nothing like waiting until the 'next to last' moment! The top had been done and waiting - so just machine quilting and binding it this weekend. LOL! And I'm afraid that's just the 'tip of the iceberg' on the "Later" list! I told you the most urgent ones last post! More have popped up! It's a beautiful weekend, but breezy. The rain has finally stopped, the ocean is blue, just enough of the breeze wafts through the condo. The best place to be is sitting by the sliding glass door, quilting away!! So I must get back to that! Rainy Weekend - better get quilting!